Based on Shinobu Ohtaka's original manga series, MAGI 2: THE KINGDOM OF MAGIC re-imagines tales from the classic story ONE THOUSAND AND ONE NIGHTS (also known as ARABIAN NIGHTS). Director Koji Masunari (READ OR DIE), who helmed the 25-episode first season, returns to this second season. Toshifumi Akai serves as the character designer and chief animation director, and Hiroyuki Yoshino (GUILTY CROWN, MY-HiME) is handling the scripts. Shiro Sagisu (BLEACH, EVANGLEION, BERSERK: THE GOLDEN AGE ARC TRILOGY) is composing the music. 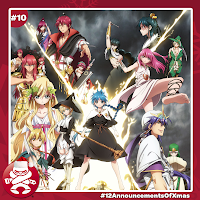 MAGI 2: THE KINGDOM OF MAGIC comes to various platforms in 2014.